Liz, William P. Graber and Paula S. Brooks both exist at the Fairborn, Ohio address. He is 55, she is 43. Spokeo shows them both at 1234 Hemlock Dr Fairborn Ohio which is the same address on the lezgetreal domain registration. The home was last sold in 2002 so they have lived there for nine years and both names are legitimate. You’re aware that Graber used the name and even the driver’s license of his wife, who, according to his own testimony, had no idea what he was doing online? Do you? However, this casts a further shadow on the LezGetReal editors. Why didn’t they check those records? They were dealing with a Paula Brooks who allegedly was in her 30s and her dad William “Brooks”, who was about 60. A simple check should have shown them that something doesn’t compute with the ages and the names. I work with people I’ve never met on blogs, and never asked for their IDs or ages or looked up who lives in their houses! Just saying. Hehe, thank you, very flattering, but so not true! Nobody who knows me would say that. Even tho I’m prolly older than you, the general consensus is that I should growp up. First: thanks for this incredibly interesting, in-depth analysis of sock puppetry. I’m really in awe of the kind of research involved in tracking down identities — screen grabs, archiving, triangulating information from mutual acquaintances! I can see better now how drawing on sock puppets might be tempting for anyone interested in identity performance, though I can also see how blurring boundaries online might correlate to blurring boundaries – often in an inappropriate or even threatening way – in other spaces and interactions (as seemed to have happened at least in Paula Brooks case). So what is it in “Amina’s” writing that felt “male”? Is it possible that there are certain markers of gender privilege that can potentially affect our authorial voice, so that even an online attempt to perform another gendered identity might ultimately come off as clumsy or overwrought or disingenuous? If so, what are those markers or attributes of authorial voicing? (Sorry I know these questions are a little different from what we’ve been discussing until now — but I’ve been thinking about them all week, so thought I should share). Anyway, this stuff is fascinating – I’m so glad there’s people like you writing about it! Fighting sockpuppets is necessary, because they distort the discussions, fake consensus, and undermine the necessary trust in a comunity. However, people should be cautious not to start a witch hunt after evidence of fraud shakes them up. I have been subject of an id check at Wikipedia once, in a rather insulting way (not much “in dubio pro reo” there). My sole fault was taking the “wrong” side in an argument where some participants turned out to be socks. There was nothing else connecting me to the fraudsters, not my writing style, not my pattern of contributions, no timetable, nothing. I’m still pissed about the way that was conducted and about the lame apology after it was established that I’m real and not anybody’s puppet. There’s nothing wrong with accountability and checks to validate the id of debaters, but those investigations should be done in a way that shows respect and fairness. Another side effect of fraudsters creating mistrust and suspicions. Those damn fakers produce lots of collateral damage in their wake. I have been following this story closely and your name keeps popping up as a sock-puppet expert of sorts and you are credited for being among the first to raise questions about Amina’s authenticity. And in this post, you talk about sock-puppetry again. Do you have any deep and trustworthy sources, other than ‘eloquent writing’, that might point to Riverbend’s existence? In the thread, you’ve taken a step back from the certainty expressed in the main post. But now that Amina hoax has completely been exposed, are you prepared to express strong doubts on Riverbend’s authenticity? I would probably have to reassess that, yes. Didn’t Salam Pax vouch for Riverbend‘s authenticity? Maybe he didn’t. I would tend to believe him if he did and knew her in person. 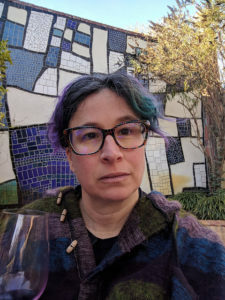 About being a sockpuppet expert, no, I have written a few blog entries, thought about it a fair amount, and given a good conference talk that turned into a longer discussion. For work, I do sometimes have to look at fraud or hoaxes among bloggers, but I think that’s true for all people with a job description like mine — some of my co-workers are probably more sensitive to particular warning signs. So while I have a little expertise, I could say the same of many subjects, as a serious dilettante. That dilettantism is certainly a strength in cross pollinating ideas and perspectives… but we should probably be looking for who the “real” experts are for their opinions. Hmm, this looks like a good start for actual expertise in sockpuppetry: the Munchausen by Internet entry on Wikipedia. Marc Feldman’s list of patterns is very useful — even if here we aren’t dealing with a person pretending a medical condition, the patterns are very similar! If you search municipal court records for Fairborn, OH, you will find William Graber has a history of conviction for domestic violence, assault, stalking, DUI among other things. Mel is absolutely correct on Graber’s criminal record. Type in Graber, William P.
On another note, Bill’s flirting partner, “Amina” aka Tom MacMaster aka Tomas Mac Maighstir has changed his avatar to a cartoon. o DEFENDANT APPEARED AS JAIL PERSON FOR VIDEO ARRAIGNMENT. o TEMPORARY PROTECTION ORDER ISSUED. JUDGE SUSAN ANDERSON. o SERVICE ACKNOWLEDGEMENT OF TPO SIGNED IN JAIL 7-14-05.
o PAY OFF THE FINES AND COSTS. I guess nobody’s surprised about domestic violence showing up in that record. After reading the stories about Graber trying to control people, reacting aggressively when folks refused to comply, this had to be expected. Damn, this guy has serious issues! It’s not as if he hasn’t his merits, too, he did some good as an advocate for LGBT issues, but he needs therapy, especially anger management. In this light, it’s probably good that people didn’t meet “Paula’s dad” in person. Whoa. I just searched for Paula Brooks- she also has an extensive record, and supposedly resides at the aforementioned 1234 Hemlock address. So there must be a real Paula Brooks. DOB 5/23/68, but no other identifying info listed in this case. also (sorry again for double posting! i’m so hasty w/ this stuff! ), it bears mentioning that Paula Brooks’ record is nothing like Graber’s. her is mostly traffic stuff along with a 4th degree misdemeanor dv charge, which probably means she defended herself and he complained about it. Those pictures on myspace don’t look anything like the picture “Paula Brooks” had on her Facebook account. The FB account has been deleted but I recall someone else entirely different. That is the picture “Paula Brooks” used on her Facebook and elsewhere. Liz, one of the best things to come out of this MacMasturbate episode is that I discovered your blog. I am grateful for your insights, as the whole Amina saga has thrown many people close to me through a loop and has hopefully made us all more discerning about our online networks. Reading you has also helped defuse some of the paranoia, and I feel that it is both worth maintaining online friendships and activist networks, and that there is a way to avoid being duped by the likes of Tom and Paula Brooks. What’s interesting to me about the Amina episode is that a few of us had our doubts about her and expressed those in private, but that we mostly thought she was exaggerating or that the contrived, incredulous and occasionally cloying sentiments she expressed were prototypical of a certain nostalgia and quest for authenticity that Arabs raised abroad– particularly in the US– often display vis-a-vis the “homeland.” In future, I will be much more likely to dig a little deeper in those instances and to trust my instincts. Thank you. That is really so informative blog,i like that and i think it increase my knowledge.